Bishop Arthur Brazier was a prominent pastor with close ties to City Hall—and once was involved in a controversial job-training program with the Blackstone Rangers street gang. I think we can all agree that Mayor Rahm Emanuel's recent proposal to rename Stony Island Avenue for Bishop Arthur Brazier is a thinly disguised ploy to boost his standing with black voters, most of whom are upset over school closings and budget cuts. I have nothing against Mayor Emanuel trying to make up with black voters whose support he betrayed. But is Bishop Brazier, who died in 2010, really worthy of this honor? 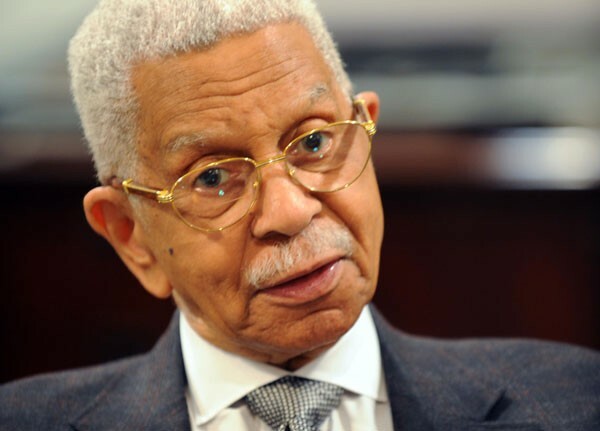 The mayor highlights Brazier's achievements: He founded the Woodlawn Organization, which protested school segregation and built millions of dollars of subsidized housing. He forged an alliance with Mayor Richard M. Daley and turned the Apostolic Church of God at 6320 S. Dorchester into a megachurch with thousands of parishioners. His son, the Reverend Byron Brazier, now runs the church, and served on Mayor Emanuel's transition team. So the family obviously has ties to City Hall. But for a different perspective, I called Natalie Y. Moore and Lance Williams, who wrote about an important moment in Bishop Brazier's career that you'll probably never read about in a mayoral press release: his involvement with Jeff Fort and the Blackstone Rangers street gang. By the way, I urge you to read the 2011 book by Moore and Williams, The Almighty Black P Stone Nation. It's a well-rounded, edgy, often funny, and ultimately tragic study of race, politics, and class in Chicago. In regards to Brazier, they key in on a 1967 War on Poverty program intended to bring the Blackstone Rangers and their rivals, the Disciples, into the mainstream by providing them with federally funded job training—even though it became obvious that few of the job trainers had ever held an actual job to begin with. Hey, it was the 60s. The federal Office of Economic Opportunity deposited roughly $927,000 into TWO's bank account. TWO, in turn, distributed it to the gang members who took or taught the job-training classes. Fort, the leader of the Blackstone Rangers, was incarcerated when the federal funds first came in, says Williams, a professor of inner-city studies at Northeastern Illinois University. "But when he got out, he made the guys turn the checks over to him. He told them, 'Ya'll had your turn. But I'm gonna use this money to build the Nation.'" In many ways, Brazier's comrade in the cause of mainstreaming the Stones was John Fry, the white pastor of the First Presbyterian Church at 64th and Kimbark. Practically idolizing Fort for his charisma and street smarts, Fry allowed the Stones to take shelter in his church. And they took advantage of his charity by using the church to stash guns, hide from the police after committing crimes, and throw wild parties. They were having one such bash at the church to bring in 1968 when Teddy Williams, a Stone, set out to buy more booze at a liquor store on 63rd. On the way he was gunned down by some Disciples. Fearing the murder might set off a bloody war that would, among other things, jeopardize the OEO program, Brazier and his top aide, Leon Finney, brought in leaders of both gangs for a peace meeting. It didn't work. A few days later, a 17-year-old Stone walked into the TWO job-training center on 63rd and shot a Disciple in the face. That shooting was the beginning of the end of the War on Poverty funds for TWO. Eventually, the feds convicted Fort and four others of fraud for forging time sheets and forcing other students to sign over checks. No one from TWO was charged with any wrongdoing. But federal officials blamed the organization for mismanaging the job-training program, which was poorly conceived to begin with. "Nothing we did was contrary to the law," Brazier told Moore and Williams shortly before he died. "You can't stop people from doing wrong." Obviously, Brazier rebounded from the controversy and went on to become one of the most powerful figures on the south side. Fry wasn't so fortunate. In 1971, he got a tip that he might be arrested by Chicago police, so he packed up his family and moved to Oregon. "I took this very seriously," Fry told Moore and Williams. "If I ever got into their jail, I'd be dead in two seconds." He passed away in 2011. The irony's not lost on Moore or Williams. "Fry got exiled," says Moore, a reporter for WBEZ. "But Brazier became Bishop Brazier and they're naming a street after him." I asked if they could imagine Mayor Emanuel proposing to name a street—even an honorary one—after Fry. Williams laughed. "There are some older people who subscribe to the conspiracy theory that Fry was an agent provocateur sent into Woodlawn by the powers that be to undermine our community by using the Stones to terrorize Woodlawn and move our people off the land," says Williams. "I have never seen anything to substantiate that claim, but that won't stop people from making it. "If I have a bone to pick with Fry, it's that he was ignorant about the community. He should have kicked the Stones out of his church. He might have been afraid of them. And Fort and his Stones were some tough street kids. They knew how to exploit fear." "So Brazier didn't like the Stones for a class reason. But he didn't let that stop him from taking that federal money. Let's be clear: TWO was the fiscal agent. The OEO money didn't go to the Stones. It came to TWO. And they gave the authority of educating gangbangers to other gangbangers? That's not good. You're the adults—you should be in charge." So let's get back to the matter at hand: Should the city rename Stony Island after Brazier? Moore's measured in her response. "I try to think of his total career—he did many good things. He's a complicated figure. But there are questions as to whether Stony Island should be named after him." Williams, on the other hand, is unequivocal. "Hell, no," he says. "And not only because of the Stones controversy." As he points out, Brazier's church sits on land that once housed tenements occupied by poor black residents. "Sure, Brazier built the megachurch," Williams says. "But he did it at the expense of the most vulnerable poor people who got cleared from the land." Localism rules in today's Chicago Tribune. Barack Obama may find a new political asset in a different south-side church. Giving federal money directly to gang members for job training? A 1967 project was so crazy it almost worked.